Family vacations don’t always have to be trips to far-away lands or epic road trips across the country. A local staycation is a great way to explore your own city while spending time with the ones you love. So before you pack a suitcase and buy a plane ticket, consider these at-home vacation ideas! This has become a popular trend in recent years, in which people gather together to track down hidden gems throughout your city via GPS. Play laser tag or paintball. This energetic game is great for adrenaline junkies and is an activity the whole family is sure to enjoy. Playing board games is one of the best ways to spend time together as a family, and when turned into an epic competition, the stakes are even higher! Whether your family enjoys musicals, plays, or the ballet, there is bound to be a production everyone can appreciate. Visit a nearby theme park. These aren’t only for the roller-coaster lovers in the family! Theme parks typically have everything from arcades to great food, and everything in between. Check out a children’s museum. There’s nothing wrong with slipping a little education into your staycation! A trip to a children’s museum is a great way to learn up on some local history and keep kids brains from petering out over the summer. Visit the aquarium or zoo. Who doesn’t love seeing all of the amazing wildlife at the zoo and aquarium? This is one of the most exciting ways to spend a warm summer day. Sporting events are always fun for the entire family, with most places offering special activities just for kids! This is a classic summer activity even little ones can enjoy. For a fun twist, try splitting up into teams (e.g. boys against girls or parents against kids) to add even more excitement to the game! There’s no need to trek into the wilderness for a camping excursion when you can make your very own campsite in your back yard! 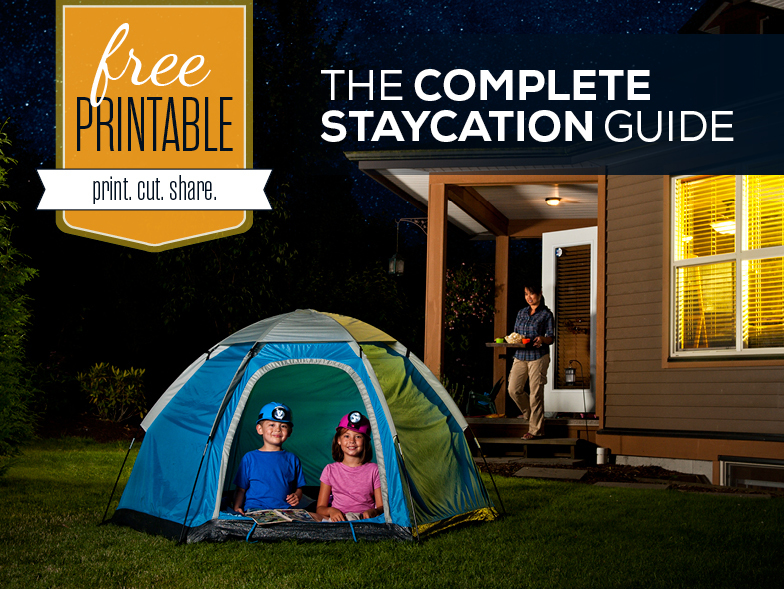 All you need is a tent, flashlights and a campfire to enjoy this fun family activity together. There are factories all across American, and many of them offer tours year-round. Whether you’re interested in how your favorite snack is made or how crayons get their wrappers, there is bound to be a tour that fits your interests. Visit a local tourist attraction. Our towns are filled with fun restaurants, shops, and historical sites that we often take for granted because we drive or walk past them every day. Try stepping inside for a new perspective. Paddleboarding is a fun summer activity that the whole family can participate in, and is a little more relaxing than jet skiing and other adventurous water sports. One of the best ways to cool off in the summer months is floating down a lazy river or flying down a water slide. If it’s a particularly hot day and you’re looking to escape, pop into a bowling alley for an afternoon of old-fashioned family fun. Take advantage of the beautiful weather and get outside, whether you’re playing sports, going on a hike, or simply relaxing in the sun, it’s important to enjoy the outdoors while you can. Summertime is always packed full of great fairs and festivals to enjoy that are bound to have great rides, games and food! Visit a nearby national park. If you leave even relatively close to a national park, consider paying a visit to take in all of the natural beauty this country has to offer. If you’re feeling crafty, starting a family art project, like tie dying for example, is a fun way to get your hands messy and create something you all can enjoy. Host your own film festival. Family movie night is a time honored tradition, and the perfect way to spend time together on those relaxing summer nights.